Near Nauset Beach, on the eastern coastal area of Cape Cod in Eastham. Grounds are open to the public year round and you can take a short hike to nearby Three Sisters lighthouses. The first recorded shipwreck on the eastern seaboard occurred on December 17, 1626, when the Sparrow Hawk, was wrecked near Pochet Neck at Nauset Beach about 3.5 miles south of the present Nauset Light. Over 200 years later, as Cape Cod became one of the busiest shipping and whaling centers in the country, lighthouses were needed to guide this ever increasing traffic. 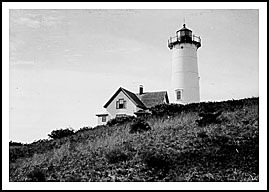 In the mid nineteenth century, Eastham (Nauset) was between the single light at Highland (Cape Cod Light) to the north, and the two lights at Chatham to the south. In 1837 Congress authorized funds to build three small lights at Nauset, which came to be known as the “Three Sisters.” These Nauset lights were America’s first and only three light station. The "Sister” lights fell into disrepair and by 1911, the cliff had eroded to within eight feet of the northernmost tower. The Bureau of Lighthouses finally decided to change Nauset to a single light. The ‘Sisters’ were moved back from the edge of the bluff, and discontinued. 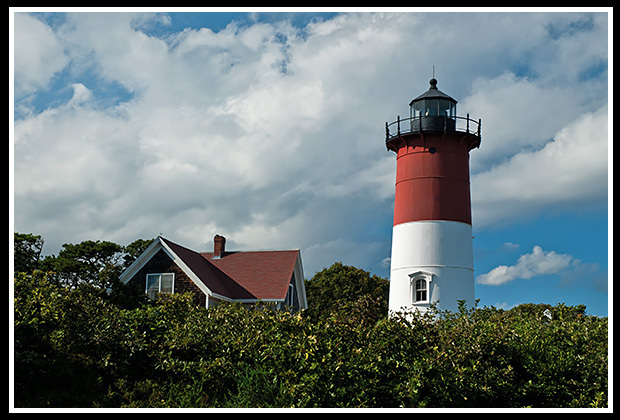 The original Nauset Light began its service in 1881 as the north light of one of the twin lights at Chatham. 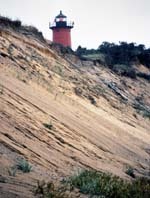 Then in 1923, the smaller wooden remaining lighthouse of the “Three Sisters” in Eastham was retired, and the north tower in Chatham was dismantled, moved to Eastham, and reconstructed about 200 feet from the edge of the cliff, leaving the one current Nauset Light to guide mariners from the shore. Coastal erosion continued to plague the lighthouse, and by 1996, it was dangerously close to the edge of the cliff with less than 35 feet remaining from the edge. In November, 1996, Nauset Lighthouse was moved in one piece to its current location about 300 feet away from the cliff. The lighthouse is maintained by the Nauset Light Preservation Society. During the summer months, you can tour the Nauset Lighthouse tower put on by the Nauset Light Preservation Society. 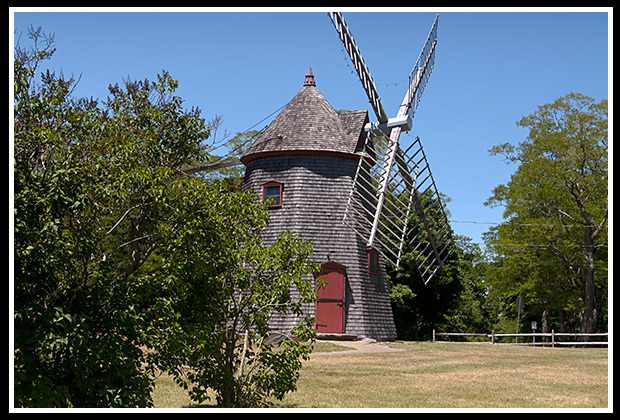 In the park, just off from Route 6, you'll find the Eastham Windmill, the oldest windmill on the Cape, originally built in Plymouth in the 1680's. Eastham is a small town that is known as the entrance to the Cape Cod National Seashore. Here you’ll find quite a variety of hiking and biking tails, along with camping facilities in the area heading over to the National Seashore. Henry David Thoreau and Henry Beston spent much time exploring the area here. You can enjoy Nauset Beach below the high sand cliffs as they rise above you near the lighthouse. A short distance from Nauset light, which the grounds are open to explore, are the restored Three Sisters Lights, although inactive, have been configured in their original spots, 1,800 feet from Nauset Light. Take Route 3 South (Southeast Expressway) to Route 6 over the Sagamore Bridge. Take Route 6 north on the Cape to Eastham and Bracket Road, to the third traffic signal from the Eastham/Orleans rotary. At the end of Cable Road, turn left onto Ocean View Drive where there is a parking lot available. From the parking lot, follow the path to the lighthouse. You can continue from the Nauset Light path and follow to the newly renovated Three Sisters Lights.